Graphtec America is proud of its reputation as a proven global leader in imaging products for the garment and apparel industry. With Graphtec, you can depend on superior performance, reliability, precision and quality production output. Graphtec professional cutting plotters are the industry top performer for small businesses to Fortune 500 companies, and MAC/PC Compatible. Graphtec Cutting Plotter can also output directly from the NScan & NShot Digitizers. The Plotter accepts Sheet paper & Roll paper. The CE6000-120AP cutting plotter helps turn garment designs into patterns both rapidly and accurately. CE6000-120AP (Apparel Pattern Cutting & Marking) is a Graphtec high-speed, professional cutting plotter designed specifically as an output machine device for apparel CAD systems. The CE6000-120AP was designed specifically as an output machine device for apparel CAD/CAM systems. The Cutter/Plotter can also output directly from the NScan & NShot Digitizers. The Plotter accepts sheet paper and roll paper. It handles a wide variety of pattern paper in widths up to a maximum of 1180 mm (when using a 2-inch core), and in a thickness range of from 64 to 130 g/m2. Innovative features include maximum cutting speeds of 39 ips (48″ CE6000-120AP) and with a maximum cutting force of 450 g. It also features an easy to use menu navigation system with eight groups of preset conditions which facilitates instantaneous recall of pre-programmed job-specific plotter setups. Two set up menus: simple and normal are available an can be chosen by the operator as desired. The pen carriage holds both a plotting pen and a blade at the same time — to enable easy switching between plotting and cutting operations. Four sets of user-specified setup parameters are retained in memory for instantaneous recall. The pen is for plotting and detailing graded patterns with seams, text, notches, Grain direction, etc. The blade is to make the perforated cut of the pattern outline. The tool is automatically switched for cutting and plotting as needed - ensuring a high quality pattern and maximum productivity. Innovative features include maximum cutting speeds of 39 ips (48″ CE6000-120 AP) and with a maximum cutting force of 450g. It also features an easy to use menu navigation system with eight groups of preset conditions which facilitates instantaneous recall of pre-programmed job-specific plotter setups. *1. Operated with Graphtec specified cutting conditions and media. *2. Graphtec specified Mylar film is used to check the accuracy. *3. For more information about compatibility of the OS or application software, please check the Graphtec website or contact your local representative of Graphtec. * Brand names and product names listed in this brochure are the trademarks or registered trademarks of their respective owners. Specifications are subject to change without notice. Looking for quality vinyl cutter machine for commercial, intermedia or entry level, Graphtec can help your vinyl cutting process become easier and improve productivity. Graphtec globally manufactures hight quality vinyl cutter machines. With years of experience in plot cutter, Graphtec is industry leader in desktop vinyl cutter, desktop vinyl cutter machine, sticker cutter, sticker cutter machine, sticker cutting machine. Graphtec is trusted by world renowned organizations around the world, our cut plotter precisely cut vinyl sheet and cut vinyl roll. 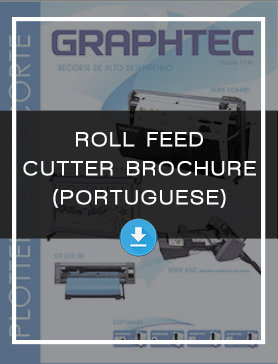 If you are looking for the high quality vinyl roll feed cutters, Graphtec specialists are onsite to provide you guidelines on how to choose roll feed cutter machine or flatbed cutter machine to suit your production needs, we have you covered! Looking for high quality vinyl cutter machine for commercial, vinyl cutter for intermedia level or vinyl cutter for entry level, Graphtec can help your vinyl cutting process become easier and improve productivity. Graphtec globally manufactures high quality vinyl cutter machines. With years of experience in plot cutter, Graphtec is industry leader in desktop vinyl cutter, desktop vinyl cutter machine, sticker cutter, sticker cutter machine, sticker cutting machine. Graphtec is trusted by world renowned organizations around the world, our cut plotter precisely cut vinyl sheet and cut vinyl roll. If you are looking for the high quality vinyl roll feed cutters or flat bed cutters; desktop vinyl cutter, small sized vinyl cutter, medium sized vinyl cutter, large format vinyl cutter, Graphtec specialists are onsite to provide you guidelines on how to choose roll feed cutter machine or flatbed cutter machine to suit your production needs, we have you covered!